Référence bibliographique : Revue Musicorum, n° 19 : "M.P.G.de Chabanon, de l'homme de lettres au compositeur", Laurine Quetin, 2017. EAN13 : 9791094472033. Articles de Konstantinos Alevizos, Claire Bustarret, Bruce Gustafson, Christine de Pas, Laurine Quetin et Clotilde Verwaerde. 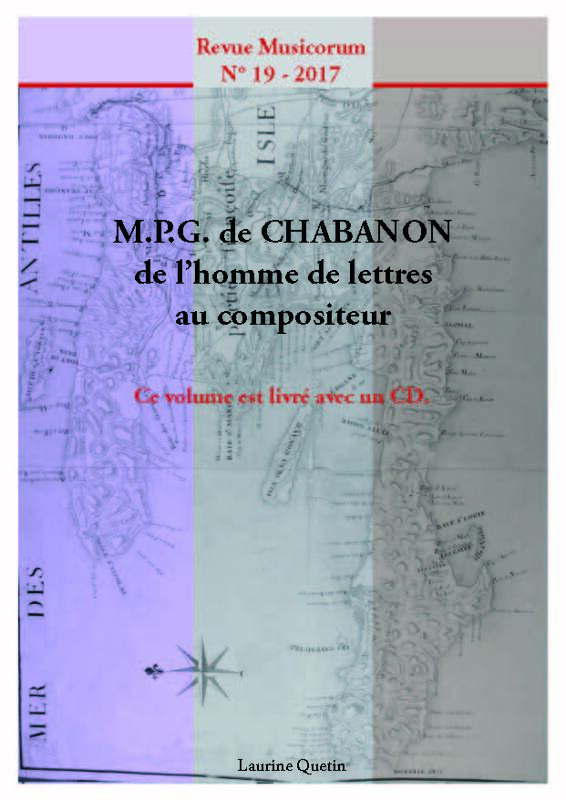 De manière exceptionnelle, la revue propose un CD contenant l'interprétation des oeuvres musicales de M.P.G.de Chabanon, éditées et analysées dans ce volume. M.P.G. de Chabanon, a « virtuose du violon » according to the Mercure de France, holds a special place in the Enlightenment distribution of roles between artist and amateur, that of the true connoisseur. His works on musical aesthetics testify to that. If his musical production is less prolific, it does nevertheless show his profound musical knowledge as well as it highlights the discipline and liberty that mark his compositional methods. Between 1770 and 1785 Chabanon composed several harpsichord or pianoforte sonatas with violin accompaniment, a genre very much experimented by contemporary musicians. He also presented the harpsichordist Madame Brillon de Jouy with a Duo that remained in her library as a manuscript. The present volume includes the critical edition and transcription of Chabanon’s sonatas and Duo, followed by an essay on the characteristics of his musical writing. A detailed biography introduces the volume.